Not sure what kind of bed linen to buy? Here’s what to consider. Keep these tips in mind when choosing bed linen. Figure out exactly what sized linen you need. Measure the length, width and depth of your mattress. Modern mattresses have added depth from 'pillow-tops' – so to avoid sheets popping off the corners, make sure you get a good fit. Pick linen with natural fibres that breathe. Cotton is the obvious choice: good-quality cotton sheets will get softer with wash and wear. But if you like your sheets wrinkle-free and hate ironing, a polyester-cotton blend may suit you better ... or look for cotton sheets with a non-iron finish. Check the seams on the wide hem of the top sheet and on the pillowcases. Stitches should be neat, tight and fairly small. If there is no sample on display, take the sheets out of their packaging and see how they feel. Go with what feels best to you, remembering that fabrics feel different once they've been through the wash a few times. High-quality bed linen has usually been singed and mercerised. Singeing (burning the tiny fuzz from the surface of the fabric) prevents pilling. Mercerising (using caustic soda to swell then shrink the fibres) increases the lustre and strength of the fabric. If you don't like the thought of sleeping between chemically-treated sheets look for organic cotton. Generally, best-quality bed linen comes at a price. A sheet with a sky-high thread count at a rock-bottom price is likely to be too good to be true. Aspects such as fibre quality and construction may have been sacrificed to achieve the bargain price. If you are looking at making a serious investment but you're not quite sure which linen is right for you, buy the pillowcases first and see how you like them. Thread count simply means the number of threads (both vertical and horizontal) in a square of fabric – either per 10cm² or per square inch. Bed linen made and sold in New Zealand usually displays thread count per 10cm². A reasonably high thread count (over 180 threads per 10cm²) is good, as closely woven fabric wears well and shrinks less. However – and this is where it gets confusing – a higher thread count doesn’t always mean better quality or greater durability. A thinner yarn produces a higher thread count as more threads can fit into each 10cm² of fabric. The fabric will be soft and smooth, but it’s also more delicate and may not last as long. Durability depends on the strength and quality of the fibre and the quality of the weave. This refers to how many yarns are wrapped together into a single thread – single-ply fabrics use threads made from 1 yarn, while 2-ply fabrics are created using 2 yarns twisted together to make 1 thread. Fabric that’s 2-ply (or more) is heavier, stronger and more durable than single-ply. The trade-off is that the fabric may not have the soft, silky feel of a high-thread-count, single-ply sheet. It’s standard practice to count each individual yarn when calculating thread count. So a sheet labelled “1000 thread count” could technically be 250 threads per 10cm², woven with 4-ply thread. When you’re buying bed linen, check for the thread count and the ply of the yarn. If it’s not specified, ask. Fibres are combed and the short ones are removed to make a smoother fabric. Varieties that grow unusually long fibres (27-29mm). A closely woven (at least 225 threads per 10cm²) plain-weave fabric (100 percent cotton or a polyester-cotton blend) with an equal or similar number of vertical and horizontal threads. The simplest weave structure: single vertical and horizontal threads woven under and over. A weave that has more threads on the surface of the fabric – usually 4 threads woven over 1 thread. It has a smoother, silkier feel than plain weave fabric. True Egyptian cotton is grown along the banks of the Nile River. Its long, fine fibres make a uniform, strong and smooth thread when twisted into yarn. The words “Egyptian cotton” can simply be used as a marketing ploy. Much of what is labelled “Egyptian cotton” also contains cotton grown in other parts of the world. So check the fine print. Unless the label says “100% Egyptian cotton” it may contain only a shred. Gabrielle Hoffman, bed linen buyer for Christchurch department store Ballantynes, advises: “Price is usually a good indicator – genuine Egyptian cotton sheets will be more expensive”. But you don’t have to rely solely on price to make sure you are getting the real thing – look for the Egyptian cotton “Authentic Seal of the Egyptian Government” on the packaging. Cotton grown in Egypt isn’t the only high-quality cotton. Long-staple cotton grown elsewhere under similar climatic and geographic conditions is arguably of equal quality. For instance, pima cotton grown in the south-west states of the US. The Observer Magazine in the UK has reported that child labour is rife in the cotton plantations of the Nile Valley. Children as young as 7 are paid a pittance to work long days exposed to harmful pesticides, to satisfy the rest of the world’s demand for luxury bed linen. Choosing a new bed isn’t easy. 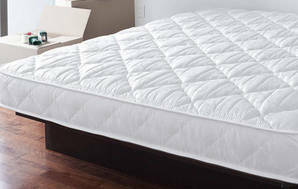 We explain what to consider when choosing a mattress and bed base. I need new hair straighteners. Please can you do some research on which ones I should buy? Which are best value for the money as they vary hugely in price.